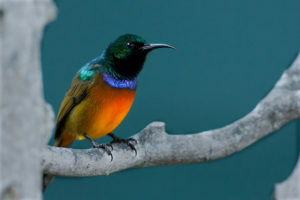 The purpose of this article is to provide the most up-to-date information on South Africa’s endemic birds (based on the 2015 update of the country’s official bird-list), and also to photographically showcase some of these birds that require a trip to Africa’s southernmost country to be seen. 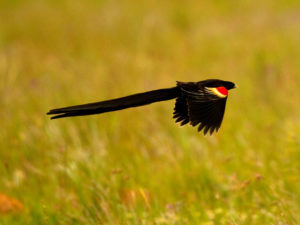 South Africa has an amazing total of 69 bird species which are confined to its borders, or nearly so. The tiny nations of Lesotho and Swaziland, both of which are virtually surrounded by South Africa (bizarrely), do kind of make things a bit complicated, though. This is because a remarkable 20 of the 69 South African “endemics” actually occur in all three countries (South Africa, Swaziland and Lesotho). One other species (South African Cliff Swallow) breeds only in these three countries but migrates to more northerly parts of Africa during the austral winter. 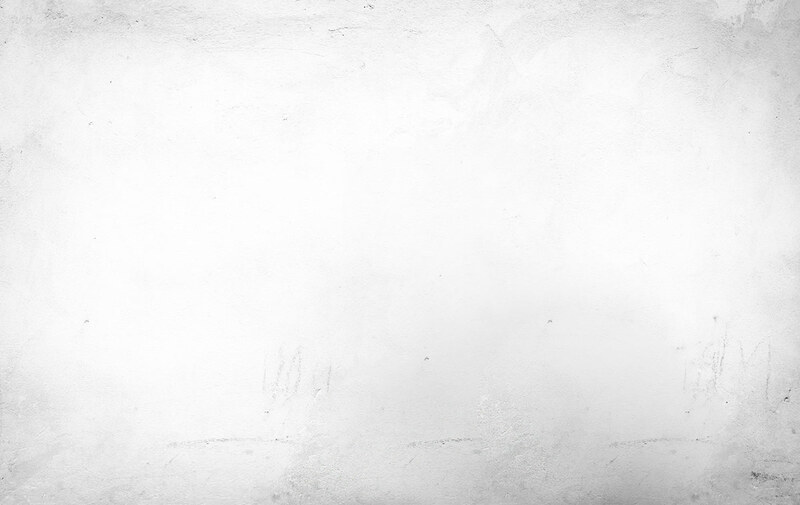 Only 18 bird species are absolutely strictly confined to South Africa. The remaining 30 species on the list are “near-endemics”, with 70 % or more of their range within the boundaries of South Africa.  And, finally, it is worth mentioning an extremely enigmatic bird that is not yet on the “endemics list”, but which could be. 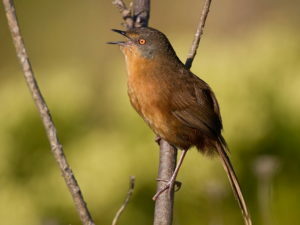 The critically endangered White-winged Flufftail (Sarothrura ayresi) is undergoing further study, but it is quite possible that this “ultimate skulker” might migrate between South Africa and Ethiopia, possibly with its entire non-breeding range in South Africa! 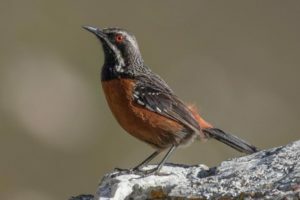 Cape Rockjumper (Dominic Rollinson) is endemic to Cape Fold Mountains and is trickier to find than Drakensberg Rockjumper (both are very localized birds but Drakensberg is common and conspicuous once in its tiny range). The table below, courtesy of Birdlife South Africa (www.birdlife.org.za) provides a comprehensive list of all 69 South African avian endemics and near-endemics – along with Red Data (RD) status of those endemic species that are threatened with extinction. 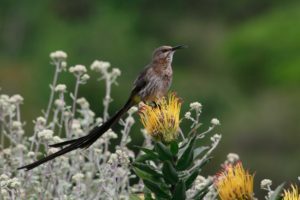 This South African endemics list is a subset of the Official Birdlife South Africa country bird list, which is updated annually and can be downloaded from the same URL as shown above. South Africa has an amazing 846 bird species, or in fact 854 species if Marion Island and Prince Edward Island are included – these sub-Antarctic islands are politically part of South Africa, yet they are almost 1000 nautical miles (about 2000 km) from the South African mainland. Cheetah: South Africa is a spectacularly biodiverse country so it’s not only about endemic birds even though these are a major attraction! And bird-wise, South Africa of course has a stack of spectacular yet non-endemic birds to keep tour participants entertained at all times – this is a Long-tailed Widow which is sometimes the first bird visitors see when arriving at Johannesburg Airport (John Caddick). Over 60 of the 69 endemics and near-endemics, including South Africa’s national bird (Blue Crane) and both rockjumper species, can be seen given 23 days in South Africa if you combine the subtropical South Africa birding tour and the 8-day Cape birding tour shown at Birding Tours South Africa. Most of the remainder can be found on the Cape, Namaqualand and Kalahari bird tour shown at the same link above, or, alternatively, on a 4-6 day trip to the Northern Cape (a summary of this trip is at South Africa 1-5-day tours). Forest Buzzard and the Agulhas Plains endemics are very tough or impossible unless you do the 12-day Western Cape tour, which includes the Garden Route, instead of just the 8-day version (giving a full 27 days in South Africa). Most South African avian endemics lurk in one of two places, 1) the Cape (the fynbos and Karoo – the toughest fynbos endemic is Hottentot Buttonquail) and 2) the Drakensberg Escarpment. But there are a good number of endemics elsewhere too. 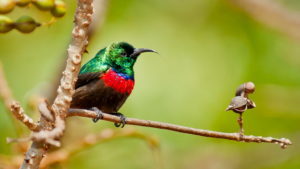 There are also some species that might have, say, 50 % of their range in South Africa, with the other half in Mozambique (for example), and the birding tour itineraries on our website are designed not to miss those either when you visit South Africa (of course). In fact, while the bulk of the endemics are seen on our tours, given 23 days in South Africa, we hope to see a stack of non-endemics as well, and a bird-list of 400 species (which include an absolutely brilliant set of pelagic seabirds) is always tried for (on the 23-day Cape/subtropical South Africa combo). And we never ignore the big and small African mammals. 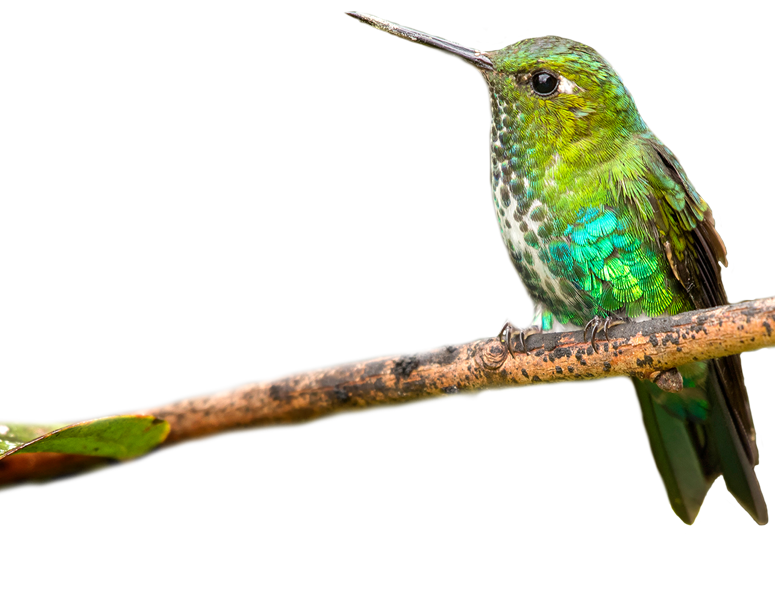 We like to see everything – including as many of the endemics as possible, but also never ignoring all the other wildlife. That’s our general philosophy as a company. The Fairest Cape, from the North Peninsula (Cape Town and Table Mountain; above) to the South Peninsula is Africa’s richest endemic region (Martin Benadie). Cinnamon-breasted Warbler manages to skulk and often remain elusive in rock crevices in semi-desert. 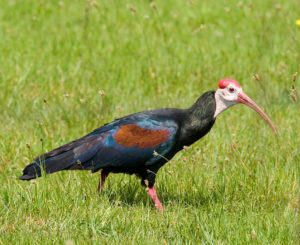 It’s quite a rare bird restricted to Namibia and South Africa.